The earlier you start investing in an RRSP, the better off you will be. Why? Because an early start means the income earned in your RRSP has more time to compound. In fact, investors who start earlier can make a smaller total investment in their RRSPs and still be farther ahead than those who make a larger total investment but start later. 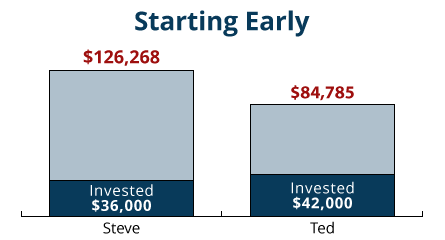 At age 65, Steve's RRSP is worth significantly more than Ted's because Steve's RRSP had more time to compound. *Assumes contributions made at the beginning of each year. Your first step is to calculate how much you may need to retire comfortably. Then you can decide on the type of retirement products that are best for you. Read through the information and if you have any specific questions send us an email and we would be pleased to help.